Nature presents itself with unusual (or maybe not so unusual) events all the time. It was a cool, Saturday morning in which I walked my dog through our small, town park. This park is really special; it has a wild area which is utilized by a variety of wildlife. On this morning I came across a Great Horned Owl sitting on a dead limb very much in the open and quite photogenic. Never one to miss photographing an owl, I continued to walk my dog home and returned shortly with my camera. The owl was still in place and not disturbed by my presence. I took a number of photos and then sat and observed as a variety of birds came by and let the owl know what they thought of his roost site. The owl barely blinked. I heard a red squirrel chattering his discontent and it seemed to be getting closer. The owl was watching this squirrel, and low and behold, the red squirrel shows up in my viewfinder, just inches from the owl. I started hitting the shutter button, checked my exposure, and tried for a bit more depth of field to get the squirrel and owl sharp. The squirrel actually gave me about five good attempts. All I could think of was this must be a crazy, Xtreme Sport red squirrels like to play; I call it “Touching the Owl”. 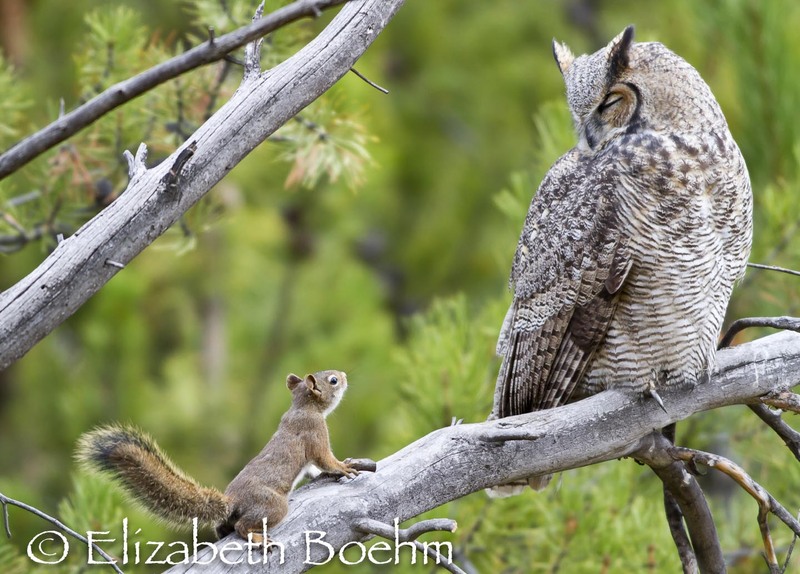 The squirrel survived and continued to scold the owl after returning to a tree a bit farther away. I will be using this space to talk about wildlife, nature, and photography musings I may have from time to time. I like to spend my free time outdoors observing natural events and will post observations as they present themselves. I will also keep you posted on any specific events I am involved in that may be of interest.